Combine dry cake mix and butter in a mixer bowl. Beat at low speed for about a minute, until crumbly. There may be large pieces of butter in the mixture, that's okay. Remove 1 1/2 cups of the cake mixture to a medium bowl and stir in cranberries and cinnamon, use your fingers to toss the mixture if you need to. To the remaining cake mixture in the mixer bowl, add the milk and beat on low until all dry mixture is moist. use a spoon to bring it all together. Again, there will be visible pieces of butter, you don't want to overheat this mixture. Heat pie filling in a large bowl in the microwave until bubbly, about 4-5 minutes, covered. Pour hot filling into a 13x9 baking pan. Top pie filling with dollops of cake batter then sprinkle with the cranberry topping mixture. Bake 30-35 minutes or until topping is golden brown and cracks appear dry. Cool 30 minutes. 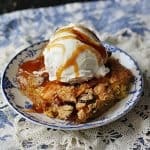 This recipe for Quick Cranberry Apple Cobbler was printed from AmandasCookin.com - https://amandascookin.com/quick-cranberry-apple-cobbler/ and can only be printed for education or personal use.